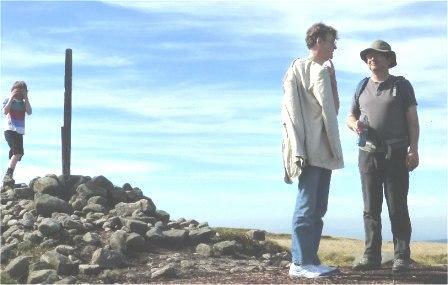 Simon (former Peak District Climate Change & Transport officer) showing Jonathan upland peat loss back in 2012's late summer. A century ago the upland peat on which we were standing would have all but covered us as indicated by the pole marker in the background left by science son. You probably don't need reminding, peat is such a carbon rich soil that dry it out and it can be used as a fuel. 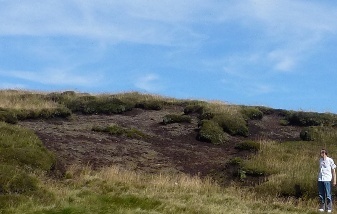 Britain's Peak District National Park recent upland peat erosion (the large dark area centre) with no vegetation cover. Climate Change: Biological and Human Aspects (2nd edition) has been used in devising the Peak District's National Park's Climate ChangeAdaptation Report 2016 . Their planning processes follows a simple approach - hope for the best and plan for the worst. It considers the consequences of a 2°C rise in global temperatures by 2040 and a 4°C rise by 2100. It also notes the difficulty in identifying thresholds. The problem is not that in its report the Peak District National Park does not accept that there will be critical transitions (it does recognise the issue), but that funding the long-term monitoring (assuming it knew what to monitor) is difficult. Now, Thomas Crowther and colleagues have given us an idea when soils globally will cease becoming a carbon sink (with plants growing roots whose carbon then largely remains in the soil after the plants die) to becoming a carbon source: soils were thought likely to be a net carbon sink in the IPCC 2007 report (WGI section 7.3.3.1.6.) and soils are some of the sub-systems contributing to the Earth system. Of course, it has to be said that the Crowther paper only gives us a rough handle on the issue: only 49 sites were used and none were in the southern hemisphere. Nonetheless this is a work whose importance should not be underestimated. The reference for the Crowther and colleagues' paper is Crowther, T. W. et al. (2016) Quantifying global soil carbon losses in response to warming, Nature vol. 540, pp104–108, and there is also an accompanying review by Eric Davidson, Nature, vol. 540, pp47-8. November 2016 saw many lights of western Europe's SF community gather in Barcelona for Spain's first Eurocon. Biologist Julie Novakov with Jonathan on the 'Where are they?' Fermi Paradox panel. Autumn 2016 Barcelona and the 2016 Eurocon. It has been a few years since I did the annual science fiction four-day Eurocon but this one was rather special in that it was Spain's first Eurocon. A good Eurocon is a great place to network and catch up with some of the key players in the European SF community, plus make new contacts and get a sense of the current buzz: apparently there were over 800 attending. The Eurocon programme saw a couple of streams largely in Spanish, a stream with a fair bit in Catalonian, and about three streams with programme items in English. The programme was diverse which meant that there was something for everyone, but the flip side was that there was little (just half a dozen items or so) science. My own minor contribution was to a small panel attended by a couple of hundred or so on the Fermi Paradox. The conclusion of which was that in terms of both science and SF there are plenty of explanations for our not seeing/detecting an extraterrestrial technological civilisation even if there are a score or more such species currently in our 150,000 light-year diameter spiral galaxy. We therefore cannot use Fermi to deduce the presence or not of other technological species. Barcelona is an interesting city with much to see. Fortunately, despite its reputation for being the pick-pocket capital of western Europe, none of us had any trouble, but then we were on our guard and had numbers on our side. This was an admirable Eurocon -- Eurocons can be somewhat of a variable feast -- and many nations who have previously run a Eurocon would have been proud to have run one that was largely as good as this, Spain's first. Those going to the Eurocon next year have Dortmund ,Germany, to look forward to: I went to the previous Dortmund Eurocon in the 1990s which itself was interesting as that was just a few years after East and West Germany re-unified. The year after that (2018) will be Amiens in France and a chance to see Jules Verne's house. fields or towns and so is bio-diverse poor. Autumn 2016 The current Paris Climate Accord will not keep warming below 1·5°C above pre-industrial says the International Energy Agency (IEA). 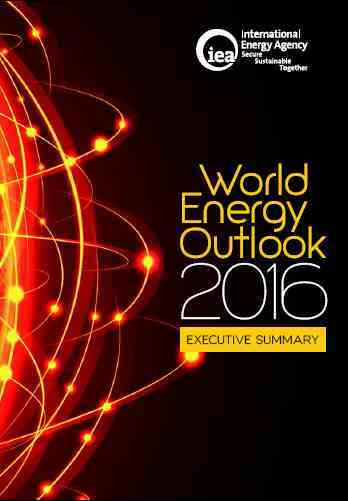 The IEA has used part of its World Energy Outlook 2016 to examine (i) whether we are on the 'policy' (as distinct from actual 'emissions') trajectory to meet the recent 2015 Paris Climate Accord, and (ii) whether we will achieve the Paris Accord goal of keeping warming below 2°C above pre-industrial and also its aspiration to keep warming below 1·5°C. The answer to 'i', says the IEA, is that the policy track the Accord laid out is being followed. Good news. But the answer to 'ii' is that -- if we continue as we are -- the total fossil carbon emissions budget that will result in 1·5°C warming will be used up by the middle of this century (2050). Even to keep warming below 2°C (this century) we need atmospheric carbon dioxide concentrations to be below 450 parts per million (ppm) of which the IEA says 'the challenges to achieve the 450 Scenario are immense'. (Atmospheric concentrations have already passed 400ppm.) If this was bad enough, then consider the Paris Accord's more ambitious aspiration to keep warming below 1·5°C. Here the IEA say that 'the transformation required for a reasonable chance of remaining within the temperature goal of 1·5°C is stark. 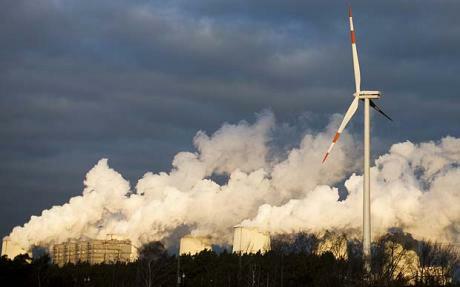 It would require net-zero emissions at some point between 2040 and 2060 (even if negative emissions technologies can be deployed at scale), thus requiring radical near-term reductions in energy sector CO2 emissions, employing every known technological, societal and regulatory decarbonisation option'. So you can take your pick, according to the International Energy Agency, between an 'immense' or a 'stark' challenge. As for my personal view, well once more I remind you that back in 2009 I said that (scroll down a little here) 'it seems very likely (without a really major change in global human behaviour) that we will exceed our 'safe' 2°C above pre-industrial level (or 1·2°C above the Earth's 2006/7 temperature) warming'. Despite after over a quarter of a century of the UN's IPCC we have yet to get a firm grip on the problem of global climate change. 2016 sees the 70th anniversary of H. G. Wells' death and the 150th anniversary of his birth. Autumn 2016 Time for a bit of whimsy to mark the 150th anniversary of H. G. Wells' birth and 70th of his demise. The leading, weekly multidisciplinary journal Nature marked this with an edition with a section of articles looking at science fiction (SF) and its relationship with science. Now, you may recall that Wells' War of the Worlds ends with the Martian invaders halted having succumbed to Earth microbes. All well and good, so back to the Nature SF edition. Coincidentally, elsewhere in it there was a news item on NASA having to reconsider its Curiosity Mars rover's path which threatened to come close to an area that may have water, hence potentially be a home to hypothetical Martian microbes. But there is an international convention not to contaminate Mars and the Curiosity Mars rover may harbour Earth microbes that could contaminate potential refugia for Martian life; a concern that is a reverse of The War of the Worlds scenario. Science fiction sometimes predicts what will eventually become science fact, in this instance it has mirrored it. Being something of a wag, I pointed this out to Nature's editorial team. It was a bit of a pleasure that the folk at Nature decided it was a wry observation they would share with its readers on its correspondence page (see bottom right). (Sole letter-only version archived here). 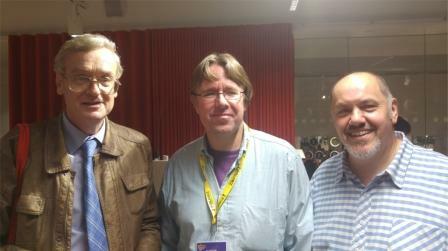 Jonathan, Alastair Reynolds and Rob Grant. 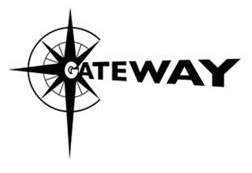 Autumn 2016 SF Gateway celebrates one million e-book sales and its 5th anniversary. As a scientist into science fiction, one of the joys of living The Big Bang Theory for real is getting invited to the occasional trade jolly. And so it was I found myself at the SF Gateway e-book imprint's 5th anniversary that also marked their selling over a million books. The event was hosted by Gollancz (from which Gateway spins out) and held in the London mega-bookshop Foyles. A score or more of Gollancz authors were present including some of their online SF Encyclopaedia compilers, added to which there were a dozen or so of Gollancz staff, author agents and other luminaries of the Brit SF community. The SF encyclopaedists also had something to celebrate: the on-line rolling edition began in 2011 with the 2nd print edition's 1.3 million words, but now (2016) the on-line rolling edition sports over 5.2 million words; as Gollancz publicist Stevie pointed out, if it existed in paper form and a copy fell on you it would kill you. The evening saw a great bash, well organised. Alas, over three hours I barely got around a quarter of those present but I did get to float SF² Concatenation's (Concatenation's arts-science genre wing) Graham's idea for a series of articles on scientist-turned-SF-writers' top ten scientists of the 20th century, so hopefully a few Gollancz authors will be among the first of a possibly lengthy run of such articles. The gathering was also a chance to catch up with past acquaintances, such as Rob Grant of the Sci-Fi London film fest (see picture) and for my to have my occasional fan-boy moments including with Alastair Reynolds (also pictured). Thank you Gollancz for the evening. And the rest of you, do Google/Bing/Yahoo (whatever) 'Gollancz SF Masterworks' for a run of some of the world's classic SF book titles available in electronic form. 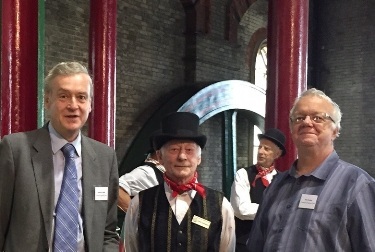 Jonathan and Alan (Concatenation webmaster) with Victorian Crossness mechanic. Excellently crafted iron work at Crossness that is positively cyberpunk. 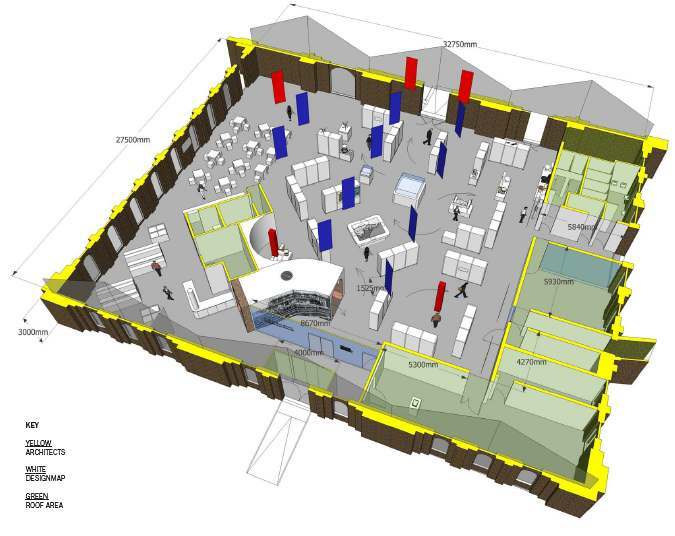 Summer 2016 The Crossness Engines Trust opens its new exhibition hall. 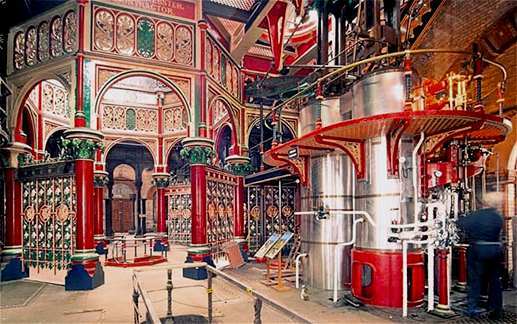 Last year saw the 150th anniversary of the opening of the Crossness pumping station that helped end the Great Stink by tackling South London's sewage. (There was a similar pump on the north side of the River Thames though it no longer exists.) The end of the year long 150th celebrations culminated on the opening of Crossness' new exhibition which has been a long time coming. Crossness is not just South London's second most important industrial heritage site (the most important being Tower Bridge) it is representative of London's ground-breaking (in more ways than one) Victorian sewage system designed by Joseph W. Bazalgette. In total (north and south of the Thames) the area serviced by Bazalgette's system was over 117 square miles. The length of the drainage sewers was 82 miles necessitating pumping engines at each of the two outfalls of some 2,380 horse power (1.775 megawatts in modern parlance). The opening of this system by Queen Victoria in 1865 not only ended the Great Stink that affected Parliament let alone average Londoners, but ended the until then chronic public health problems from the previous ramshackle sewerage system such as cholera outbreaks. But to my mind the technology of Crossness and the Bazalgette system was key to the start of global urbanization. The industrial revolution saw the beginnings of agriculture's mechanisation that boosted output enabling a larger population. With treatment systems such as Bazalgette's it was possible to deal with the waste arising from all that food consumption. Consequently, both improved agriculture and large-scale sewage treatment were fundamental to enabling large cities to exist. And so the balance of the world's population began to shift from being largely rural to being largely urban. Globally, the proportion of people in urban areas rose from 29% in 1950 to 49% in 2005 and is expected to reach 69% by 2050 (People and Planet, 2012, Royal Society, London). This was paralleled by a growth in the global population, that was very roughly a billion when Crossness opened in 1865, passed two billion around WWII, three billion in 1960, four billion in 1974, five billion in 1987, six billion in 1999 and seven billion in 2012: a population whose size is not possible unless it can be both fed and kept clean. My own presence at the exhibition's opening was due to having provided Crossness with a press liaison service for nine years up to 2014. I attended the new exhibition hall opening with Concatenation's webmaster Alan who several years ago had for over a decade worked for Crossness ending up on its board. Among those also attending was Bazelgette's great, great grandson, Sir Peter Bazelgette. 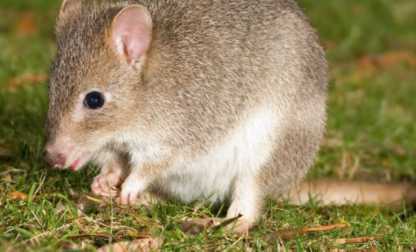 The Bramble Cay (Melomys rubicola), the first mammal to become extinct due to climate change. What warming would result if we burnt all the economically recoverable fossil fuel? These results indicate that the unregulated exploitation of the fossil fuel resource could ultimately result in considerably more profound climate changes than previously suggested. Of course, the Earth has been this warm in the past (and so life will survive) but has not been as warm as this for millions of years and so will be critical for non-tropical biomes (temperate, boreal etc). Now, I have not yet read the full paper (I do not subscribe to Nature Climate Change) and so can only see the abstract and the first page. Nonetheless I wonder whether the CMIP5 models they use fully capture long-term feedbacks (such as carbon release from soils)? If the models don't, then the warming could well be even greater still! This would mean that their results are a good indication of the lower limit to possible warming. However I will get around to reading the whole paper when it goes open access, especially as the paper has cited Climate Change: Biological & Human Aspects (2nd ed.) as one of its 30 references. Personally, I prefer Rollerball: the 1970s version not the newfangled 21st century game. Spring 2016 It has been party time in Leics with Leicester City winning the Premier League! Against much odds, the Foxes have won the Premier League. Who would have thought it? The betting shop odds at the beginning of the season were over 5,000 to 1. That means – as some did – placing a bet of just £10 netted a win of £50,000 (US$70,000)! The real party took place some miles away in Leicester itself. But scientifically I could not help but think of the way that in life small leptokurtic distributions within larger, distributions with long tails crop up time and time again. In this instance the factors those in the betting industry use to calculate odds were blind-sided by failing to properly take into account the mix of team-member ability, team training and the happenstance of the premiere draw of who played whom. In real life we use a range of climate models but some that take into account, or weight more, some factors that other models do not, and these few models may come up with radically different results to the majority of other models. Another example might be the risk of a crop being contaminated by pollen from its GM (genetically modified) counterpart. Commonly – and this is the main probability – the risk of such pollen contamination gets less with distance and so those producing the seed for crops themselves have to ensure that their crops are sited more than a certain minimum distance from crops of the same species to avoid contamination: these are official agricultural regulations. All well and good, but suppose one year GM farmers decide to go to a conference in another country around the world. In this instance a second, lesser GM transference probability comes in to play due to the farmers' movements. For example, GM pollen might get caught in a farmer's turn-up or other clothing and is then carried around the world to contaminate a very distant crop. Small, but sharp (slender) peaks within the tail of an otherwise bigger and broader probability distribution are 'leptokurtic' (leptos comes from the Greek meaning slender). They occur more often than you may think as sometimes in addition to a principal probability peak there may be a smaller but sharper, and certainly significant, peak tucked away at the far end of one of the main probability curve's tail. Keep an eye out for these as, against the odds, you may get a surprise result. The Foxes did in Leicester. Notwithstanding the above, I cannot claim to be a football fan: rollerball is more my scene…. Spring 2016 Prof. Sir David Mackay F.Inst.P. has sadly left us aged only 48. David Mackay was the Chief Scientific Advisor (CSA) of Britain's governmental Department of Energy and Climate Change (2009-'14) and if you reside in Britain you will undoubtedly have occasionally seen him on the news or in television documentaries. Over the years, I have worked with a number of CSAs, though mainly with those more concerned with biology. However my interest in climate change meant that I encountered David a number of times and I invariably enjoyed his presentations. In 2009 he kindly took part in the end-of-symposium outreach panel on: 'Past rapid changes in CO2 levels and the climate system: lessons for the future' for the carbon isotope excursion (CIE) event that Anthony Cohen and I convened. His parting this April was when he was way too young. Fortunately, his contribution to climate science and energy use was recognised just a few months ago when he was made a Knight of the Realm for services to 'Scientific Advice in Government and Science Outreach': an honour well deserved. 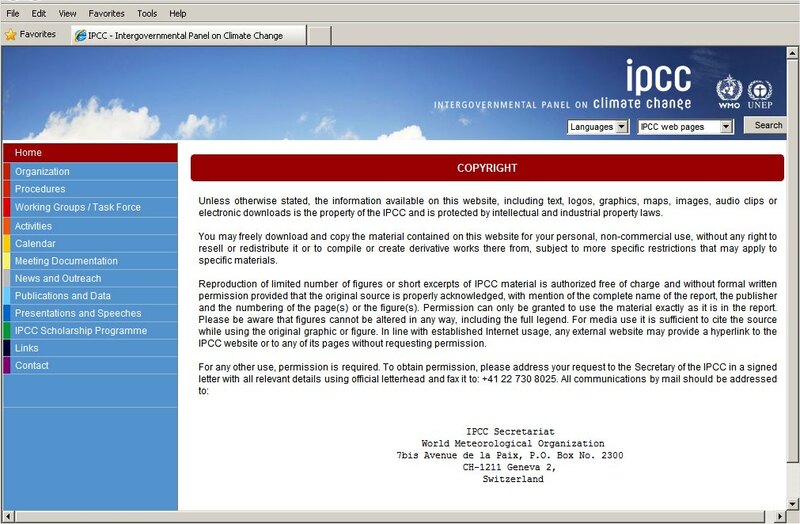 © IPCC 2007. Figure C3.1. from IPCC WG1 AR5 2013. Relative vulnerability of coastal deltas as shown by the population potentially displaced by current sea-level trends to 2050 (Extreme = >1 million; High = 1 million to 50,000; Medium = 50,000 to 5,000; following Ericson et al., 2006). Spring 2016 A study in Nature reveals that sea-level rise are likely to increase in the further future faster than the IPCC predict they do today. Polar temperatures over the last several million years have, at times, been slightly warmer than today, yet global mean sea level has been 6–9 metres higher as recently as the Last Interglacial (130,000 to 115,000 years ago) and possibly higher during the Pliocene epoch (about three million years ago). In both cases the Antarctic ice sheet has been implicated as the primary contributor, hinting at its future vulnerability. The Nature paper by Robert M. DeConto & David Pollard. Their work suggests that Antarctica has the potential to contribute more than a metre of sea-level rise by 2100AD and more than 15 metres by the year 2500. The IPCC's 2007 AR3 1990-2100 'best estimate' for sea-level rise from all causes (thermal expansion and northern and southern hemisphere ice melt) is roughly a third of that now estimated by DeConto & Pollard for Antarctic melt alone and roughly half the IPCC 2007 high-level estimate. True, the IPCC upped its sea level rise scenario forecasts in its 2013/4 fifth Assessment Report (AR5) but the new DeConto & Pollard (2016) forecast for Antarctica melt alone is still a third again higher than the IPCC's AR5 best estimate for rise due to all causes (not just Antarctic melt) under its RCP 8.5 (business-as-usual) scenario and just a little over its high estimate! Why do I draw your attention to DeConto & Pollard work? Well, estimating future sea-level rise from global warming is difficult. In Climate Change: Biological & Human Aspects I spent six pages on the possible surprises of sea-level rise estimates (Section 6.6.3 in the second 2013 edition). On p335 I noted that the sea-level during the last interglacial was 6m higher than today and that there were rapid jumps of 2-3m during which rise more than 36mm a year. Yet in my last book I was being rather coy and conservative, just reporting the current reasonably established and accepted view from the science literature. (The job of that book was to report the science and not confuse students with my own wild musings.) You see for many years I have harboured the suspicion that we need to prepare for up to 2 metres of sea-level rise between 1990 and 2100AD. 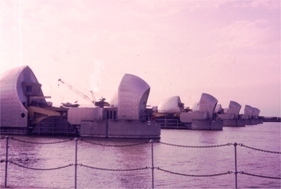 Indeed, back in July 1998 I was invited to take part in a climate change sea-level rise workshop by the Environment Agency at the Thames Barrier and opined, citing references from the peer-reviewed research literature, the need to worst-case plan for flooding up to 2 metres. Truth be told, many of the civil servants there were disbelieving, some (tut-tuttingly) vocally so. However I did receive support from one leading scientist present Hermann Bondi (former Chair of NERC and Chief Scientific Advisor to the Department of Energy). He noted my basing my concerns on bona fide research saying 'how nice it was to have a presentation based on actual data'. So why was my 2 metre estimate for worst-case sea-level rise over the coming one hundred years far higher than the IPCC's? And why was Hermann Bondi interested in this wild concern from a then young scientist? The IPCC – be it for better or worse – lays great store by computer modelling, and indeed many millions of pounds have been spent worldwide on such modelling since the IPCC's first Assessment (1990). Conversely, I only use models as in indication of possible likely change: instead, I lay greater store by what the Earth system has actually done in the past. Now, there are reasons why the IPCC does what it does: current change has no direct analogue in the past. Yet studies of past sea-level rise have shown rises of the order of a couple of metres a century both at the end of the last glacial and at times during the previous interglacial when global temperatures were comparable to today if not for a time a little warmer. Given this, and that current warming is faster, it seems to me that a reasonable conclusion could be that sea-level rise might, in the worst case, at the least be of the order of 2m per 100 years. Furthermore, the IPCC explicitly says in the main body of its scientific assessments that with regards to warming it is ignoring the difficult-to-quantify long-term feedbacks and also, with specific regards to climate change, in its AR5 (2013) noted that ice sheet instability had not been critically assessed. It is this last -- ice sheet instability -- with regards to Antarctica that the DeConto & Pollard take into account. Since the 1998 workshop, some research suggests that sea level rise may be higher than the IPCC forecast. Previously unforeseen melt has been detected in the northern hemisphere (for example Gardner et al, 2011, Nature vol. 437, pp357-360), some new models also point to possible higher sea-level rise over the 21st century (for example Rahmstorf, 2007, Science vol. 315, pp368-370) and there have been other Antarctica melt estimates such as the West Antarctic Ice Sheet alone could contribute some tens of centimetres by 2100AD (SCAR, 2009, Antarctic Climate Change and the Environment , Scott Polar Research Institute: Cambridge, Great Britain). The official science view has over the years moved closer to my own. And so I ponder if, and possibly when, the accepted science view will one day affirm my concern that at a worse case we could possibly be looking at up to 2 metres of sea level rise over a century? The Accord laudably seeks to hold warming “well below” 2°C above pre-industrial temperatures and urges nations, if possible, to pursue an even stricter target of 1·5°C. How likely is it to succeed? Well, consider the success (or not) of the 1997 Kyoto Protocol. Kyoto aimed to reduce emissions by 5% of what they were in 1990 (though some nations were allowed a 1995 base year) by 2012. Did that happen? Errr..., looking back emissions rose every year since 1997 apart from a couple following the 2007 financial crisis. So going by past Kyoto performance, the Paris Accord does not seem promising. But being realistic, are the Paris Accord's targets practically feasible? In theory 'yes', but it does mean some dramatic cuts. The Intergovernmental Panel on Climate Change (IPCC) previously concluded that holding warming to 2°C will probably require emissions to be reduced from their 2010 levels by 40–70% by 2050. Achieving the 1·5°C target would require substantially larger emissions cuts of around 70–95% by 2050. So, with this in mind you can guess what I think. And then a couple of weeks later, just as we were tucking into our mince pies, Kevin Anderson (the Deputy Director of Britain's Tyndall Centre for Climate Change Research) gave us a behind-the-scenes look at the Paris COP in Nature's Christmas edition ('Talks in the city of light generate more heat.' vol. 528, p437). Apparently the supporting papers at the COP suggest that the strategy for achieving these goals relies on biomass energy carbon capture and storage (BECCS). This basically means harvesting biomass, burning it to get energy, and then pumping the carbon dioxide into geological strata trapping it (hopefully) for millions of years. Itsy-bitsy problem. According to this plan the area of crops harvested will be close to three times that of India! Can you honestly see that happening in the mid-21st century, population swollen, hence hungry, world? Worse, while there was unease by some scientists present, it was reported that 'senior figures' and 'handlers' briefed against those who dared question the political reading of the science. You could hardly make all this up, and it seems more than a little Orwellian. Of course, there are other ways to achieve the Paris goal, but high carbon taxation so as to pump massive investment in renewables and nuclear does not seem to be happening at anywhere near the level required, and we'd still have to curb air travel (while Britain's politicians currently agonise over a third Heathrow runway). Some circles simply cannot be squared. And then we really have to do something about that taboo topic of reducing global population. STOP PRESS 30th June 2016: Over six months later and the above concerns as to the Paris Accord's feasibility have been echoed by a paper in Nature. Joeri Rogelj et al have calculated that the Paris Accord nations' intended greenhouse emissions (INDCs in climate policy speak) imply a median warming of 2.6–3.1 °C by 2100AD. Substantial actions are required to maintain a reasonable chance of meeting the target of keeping warming well below 2 °C. Rogelj, J. et al. (2016) Paris Agreement climate proposals need a boost to keep warming well below 2 °C. Nature vol. 534, pp631-639. All this sadly echoes the appraisal made in my 2009 essay Can we beat the climate crunch whose sentiments in turn were subsequently reflected by several others. Winter 2015/6 Media and politicians act surprised as Britain's floods surmount new defences, while the UN COP climate summit in Paris takes place. While the world's political leaders met in Paris for the 2015 climate summit to derive an international treaty to succeed the 1997 Kyoto Protocol, the northwest of Britain saw over 5,000 homes flooded and in Cumbria alone 2,500 homes without power. 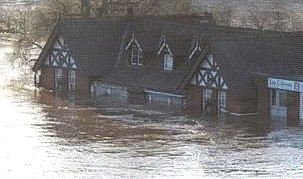 The area has suffered from extreme floods before in 2005 and 2009 and new flood defences were created. But the rainfall has been record-breaking. The Met Office said Honister in Cumbria received 341·4mm (13.4in) of rain in the 24-hour period from 18:30 GMT on Friday 4th December to 18:30 GMT on Saturday 5th. This beats the previous UK record set at Seathwaite, also in Cumbria, of 316·4mm (12.4in) on 19th November 2009. Now, while we cannot directly attribute this December 2015 flood event to climate change, we can very definitely say that such extreme events are exactly what we expect with warming. This may seem a somewhat nuanced distinction but it is important that climate scientists be as precise as they can in statements lest public and political trust is lost. Alas, not covered by the media is the latest academic paper from Met Office scientists that detailed the link between the 2013/14 extreme rainfall events with climate change. The winter of 2013/14 was one of the most exceptional periods of rainfall in England and Wales in at least 248 years. 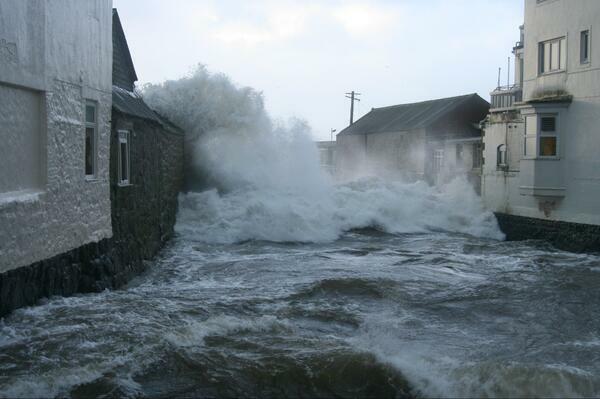 It marked the wettest December and January in the UK as a whole since 1910. According to the analysis, the odds of those storms bringing such extreme wet weather were seven times higher than on a planet that was not warming. Part of the reason is down to a relationship known as the Clausius-Clapeyron equation: so for each degree of temperature rise, the atmosphere can hold an extra 7% of moisture. The other part is that our warmer world is seeing air circulation patterns change and Britain is seeing the jet stream more often drive air circulation carrying water vapour from the ocean. © IPCC 2007. The probability of extreme events increases disproportionally with warming. This is from the IPCC AR4 Technical Summary for Working Group I. 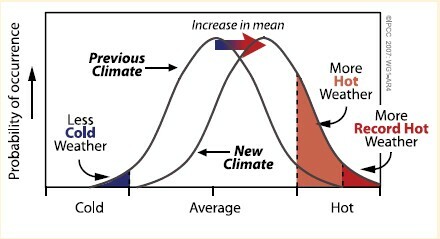 This graph relates to extreme hot weather events but it is equally applicable to extreme rainfall events in maritime climate zones and, seemingly paradoxically, drought events in arid climate zones. A small shift in the distribution (a small amount of overall warming) results in a large increase in extreme events at one end of the distribution. This was made plain to governments by the UN's IPCC in 2007, so there really is no excuse. See also the sections beginning pages: 330, 355 and 358 in Climate Change: Biological & Human Aspects , 2013. Personal thoughts:- The Clausius-Clapeyron relationship in this instance has to apply to 'extreme events'. While overall warming might seem small, such is the tail of the probability, Bell-like curve for the new warmer world curve superimposed on the past world curve, that the frequency of extreme events is greater! This means that it is not just prudent, but to be expected, that extreme events will increase in both frequency and intensity with time. Flood defences therefore need to be designed with an extra margin of error. As warming continues we must expect a continuation of record-breaking events. This means that we need to monitor the extent of each extreme event so as to maintain the margin of error enhancing defences with each record-breaking event. Failing to plan with this science in mind will see homes that might have been considered protected by new defences once more being flooded. Building flood defences on the cheap is a fool's economy; we need to plan and protect ahead of the curve, not on it, lest we end up behind it. 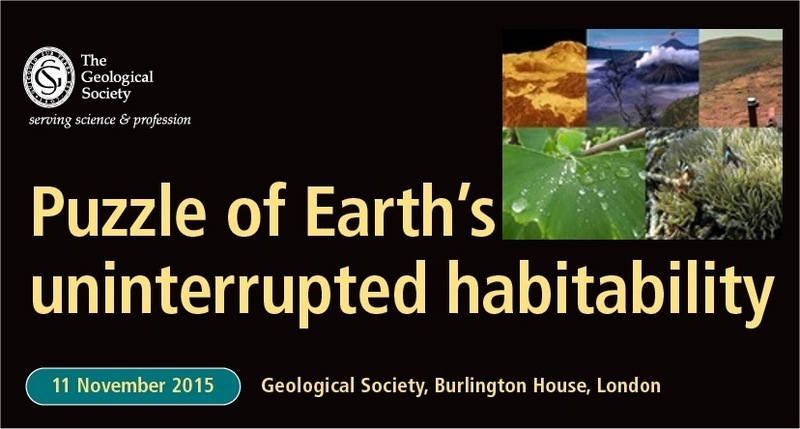 Autumn 2015 The Puzzle of Earth's Uninterrupted Habitability – More continuing professional development (CPD) with a symposium. Environmental conditions at the Earth's surface have been continuously suitable for life for more than three billion years. For example, temperatures have only varied by few tens of centigrade despite large changes in solar luminosity and atmospheric composition. Since the Archaean, the planet has not once been rendered sterile. However, the reasons for this long-term life-friendliness remain contentious. How has Earth’s climate avoided the runaway warming shown on Venus or the runaway cooling of Mars? Has Earth's relative stability resulted from geochemical feedback (e.g. through silicate weathering), the stabilizing influence of a complex biosphere (i.e. the Gaia hypothesis), good luck (e.g. 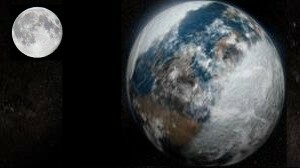 purely fortuitous cancellation of solar warming by decreased greenhouse gas concentrations), or is long-term life-friendliness simply the consequence of life’s extraordinary adaptability (allowing it to survive even Snowball Earth events)? This symposium brought together proponents of these various views in an attempt to forge a consensus on how to move the science debate forward. Autumn 2015 30 seconds of fame. Just to field further questions coming my way, yes, 'twas I being cited at the very end of Radio 4's News Quiz with some whimsy. A deputy leader of a council led with his chin when commenting on an austerity decision to switch off street lights after midnight. Apparently it was a decision 'not taken lightly'. So that's 30 seconds gone of my Wharhol 15 minutes of fame. Looking forward to what the fourteen-and-a-half minutes to come will bring. Looking east from Carmelite Ho towards Tower Bridge and the Shard. Looking west towards the London Eye and Palace of Westminster. 3rd Floor is the home of Orion (with its SF/F imprints Gollancz and the e-book SF Gateway). 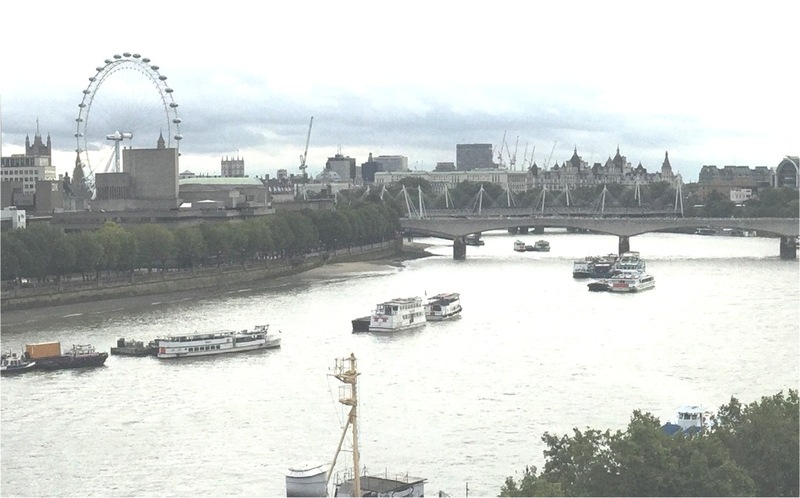 The Hodder gathering took place on the roof top which has a spacious bar overlooking an equally spacious roof-top garden that gave excellent views of the Thames. Sadly the sun was just setting and so the picture below does not do the panorama justice. 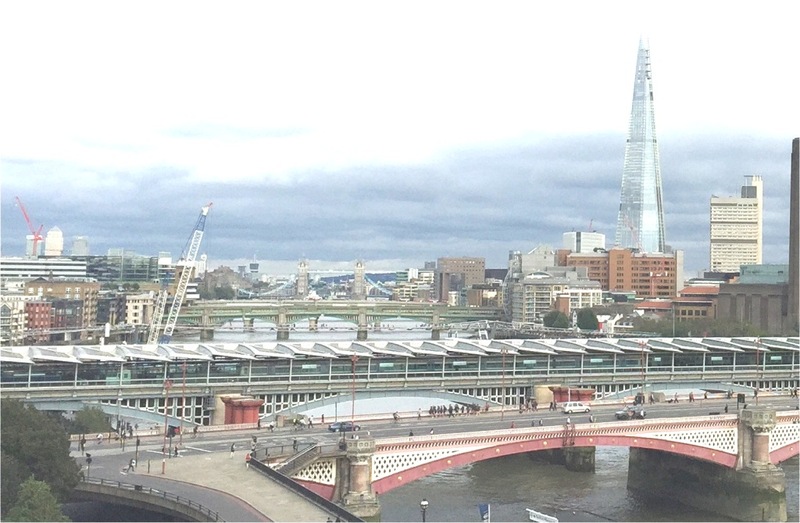 Nonetheless, viewers can see the Houses of Parliament and London Eye to the west. The panorama below is a low resolution version of an original picture from which I have extracted blow-ups (see pictures to the above left) looking to the east and west. Thank you Hodder for the evening and bringing excellent company together. 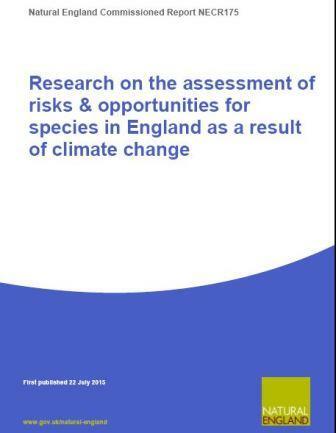 Summer 2015 Natural England produces a climate change risk assessment for species. The independent government departmental agency responsible for promulgating England's biological conservation, and conservation policy, has produced a useful assessment. This worthy project deals largely with the potential for species' ranges to change under climate change. It also recognises that much can be done to increase resilience to change within existing distributions and this report may help to focus efforts to do this, as well as identify opportunities to facilitate range expansion. With regard to this last, they do leave out 'for how long' given how warming is beginning to progress (as exemplified by another report -- departmentally commissioned -- discussed in the next item below). Of personal interest (and further to my on-going behind-the-scenes chivvying -- see also below) the Natural England report does refer to species translocation. 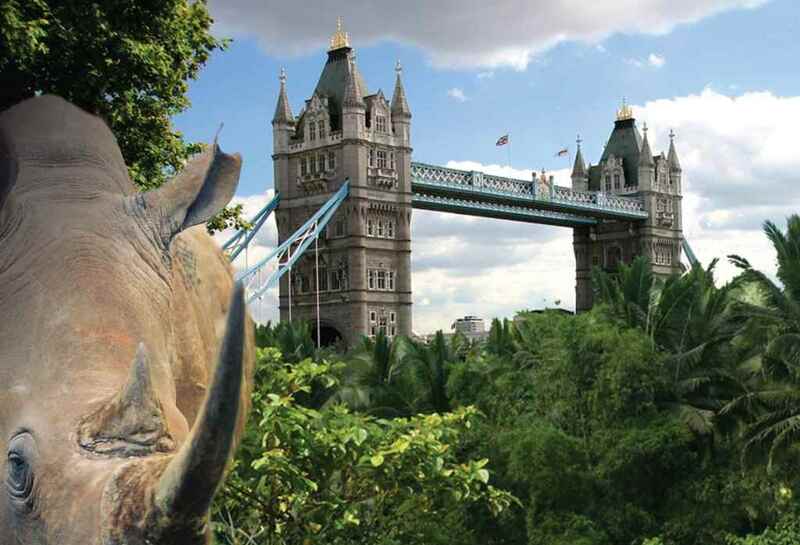 This is to be welcomed, but its coverage of this issue is very limited: the report looks at species translocation purely in the context of biological conservation albeit due to a conservation need arising from climate change. What it does not do is address the need for species translocation due to climate-induced biome shift, even if it does mention (not very clearly) new 'climate space' issues. This may seem a subtle difference, more of nuanced, rather than fundamental, climate change ecology. But nonetheless it is a very important one! Some individual species will certainly need a helping hand as warming progresses; such as those at the top of uplands that become too warm and so need to be moved to a cooler environment further north (poleward). But single species' emergency helping hands fail to address the fact that key species (some even key to ecosystem function), and especially long-lived, fairly static species (such as trees) who may not be at threat now, will be within these species' generation or two's time. Climate-change-induced biome shift (and not just the failure of some individual species to track climate change) is still being ignored. Here, also overlooked are the lessons from palaeo-ecology as to how species responded to past climate change (such as between 20,000 and 10,000 years ago which saw climate change of a comparable temperature magnitude to that of today but a hundred times [two orders of magnitude] slower). This raises a raft of issues, such as: novel ecosystem creation and management; species' genetics (should genetic diversity be maximised, or just leading-edge genetic diversity preserved [that can be more easily done when things happen slowly], or main transient-body genetics and even the refugia population); let alone a raft of other issues (such as the aforementioned ecosystem function). We simply do not have the guidelines and protocols in place (as we do for single species translocation purely for conservation purposes). 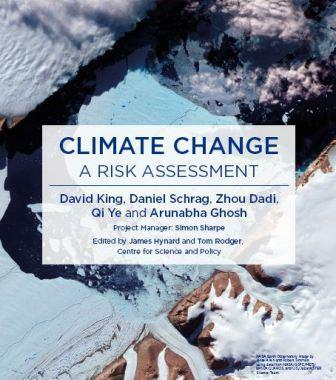 Summer 2015 A (UK) Foreign and Commonwealth Office commissioned report has been published by Centre for Science and Policy at Cambridge University: Climate Change: A Risk Assessment. With its lead author a former Government Chief Scientific Advisor and current UK Foreign Secretary’s Special Representative for Climate Change, David King, and sporting a politically endorsing Ministerial foreword by the Rt. Hon. Baroness Anelay, it has both political and science credibility. And it is also a very sensible assessment. Its principal conclusions are that we need to prepare for a warming of greater than 2°C. On all but the lowest emissions pathways, a rise of more than 2°C is likely in the latter half of this century. On a medium-high emissions pathway (RCP6), a rise of more than 4°C appears to be as likely as not by 2150. On the highest emissions pathway (RCP8.5), a rise of 7°C is a very low probability at the end of this century, but appears to become more likely than not during the course of the 22nd century. A rise of more than 10°C over the next few centuries cannot be ruled out. Meanwhile, this new report seems to have been produced as a contribution to the debate six months before the UN climate COP meeting in December. Reference: King, D., Schrag, D., Dadi, Z. & Gosh, A. (2015) Climate Change: A Risk Assessment . Centre for Science and Policy. University of Cambridge: Cambridge, Great Britain. Summer 2015 Bumble bees are failing to track with climate change according to research in the journal Science (vol. 349, pp177-180). For many species, geographical ranges are expanding toward the poles in response to climate change. Using long-term observations across Europe and North America over 110 years, the researchers tested for climate change–related range shifts in bumblebee species, and they are not shifting polewards! The researchers did find range losses from southern range limits, and also shifts to higher elevations among southern species. But no range gains at higher latitude: the northern range limits. Now, biome shift is to be expected with global warming as temperatures in low latitudes get too warm as well as also formerly cool temperatures at higher altitudes that warm to become new acceptable limits for bees. What is disturbing is that the researchers found failures to track warming over recent decades at species’ northern range (high latitude) limits: these failures occur in both Europe and N. America. This means that the species' overall range is declining. In this case the cause seems to be that the species does not like to move far. For what it is worth here are some personal thoughts… Could it be that bees have a predilection not to wander too far from their hive and maintain this trait when setting up new hives? If so it would explain: the southern (low latitude) retreat (when it gets too hot the bees die); the failure to track at high latitudes (bees don't like moving); and the bees able to track climate by extending their range up mountains with warming (altitudinal/vertical change in climate zones occurs over a very short distance compared to the distance for analogous horizontal/latitudinal climate zones). The few of you who follow my news pages, and indeed the 2013, 2nd edition of my climate change textbook (its appendix 4), will be aware that for the past few years I have been arguing for the need to consider species translocation to address climate change induced biome-shift and to develop guideline protocols. Currently, species translocation protocols (such as from the IUCN) were derived to address individual species conservation and not climate-induced biome shift in which factors such as conservation of ecosystem function need to be included among others. Sadly, despite very encouraging noises I've received from various stakeholders, to date it has proven difficult to get the ecological community to formally engage in considering this issue (though I did predict this difficulty in my 2013 appendix). 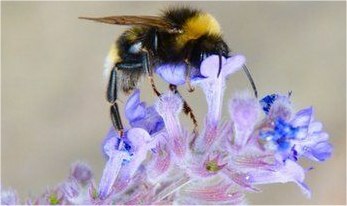 However, in this case the researchers themselves do pose the question as to whether bees might be a candidate species for translocation due to climate change induced reasons. 1950 actual and 2099 forecast January temperatures from the 2015 NASA data made publicly available. I could have presented June data but, with most of the Earth's land in the northern hemisphere (which has summer in June), that makes the warming seem more pronounced and I'd hate to scare the horses (but do note what happens in the southern hemisphere's January summer). Nonetheless, much of Britain will in 2099 likely experience frost free winters. In turn, one ecological impact of this will be increased surviving agricultural and garden pests. Summer 2015 NASA has made its global climate change data set publicly available. It combines historical measurements with data from climate simulations to provide forecasts of how global temperature and precipitation might change up to 2100 under different greenhouse gas emissions scenarios. The picture on the left shows the difference in January temperature between 1950 and 2099 under business-as-usual (assuming we do not curb the current [early 21st century] trends in fossil carbon emissions). For the technically minded, this is the IPCC's 2013 RCP 8.5 Ensemble Average scenario. 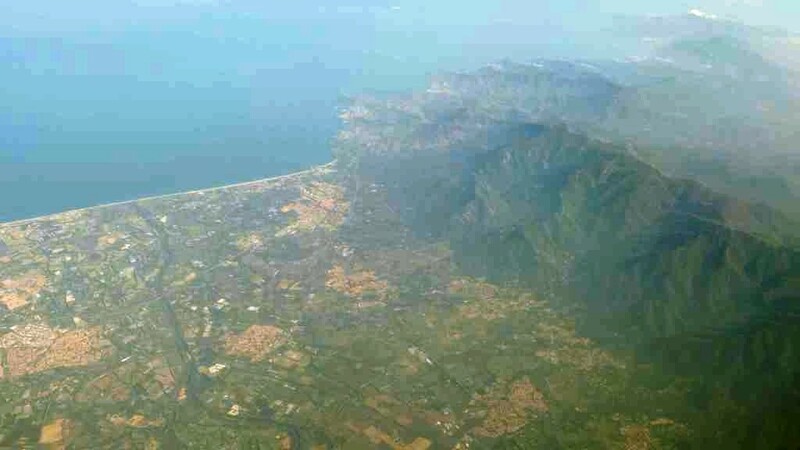 The new dataset is the latest product from the NASA Earth Exchange (NEX) based at NASA's Advanced Supercomputing Center at the agency's Ames Research Center in Moffett Field, California, USA. https://nex.nasa.gov. NASA's move to make its data publicly available is one shared with academia as a whole on both sides of the Atlantic: it is increasingly common for science journals to make their data freely available. This 'open access' is ethically driven; after all the public have already paid for this research through their taxes funding universities and research institutes, so why should they pay for the research twice? There is also an argument that open access is good for science as researchers have the opportunity to be better informed. on a glacier's medial moraine. 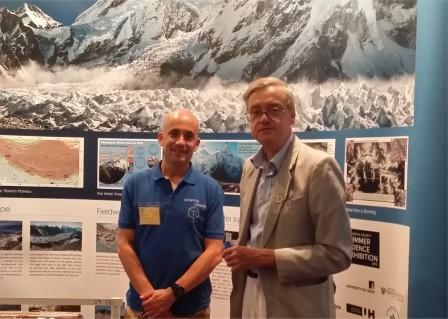 Summer 2015 This year's Royal Society Summer Fayre covered a number of areas of interest including: climate-change-induced glacier melt (yup, they're going…); the origins of life (it really looks like geothermal vents are key for energetic reasons, but please don't add the words 'deep sea'); and proving that the remains discovered in a Leicester car par were Richard III's (strange to come down to London to the fayre for something from not that far down the road). The annual Royal Society Summer Fayre is something I try to get to, and do quite a few years when I can contrive the diary for an in-town day engagement as there is always something of interest plus friends turn up for a social after. The surprising thing is that the fayre is not more popular: one of London's better kept secrets. The glacier melt exhibit was of greatest personal interest, and doubly so when I found out that this display was put on by my old college, and that my old tutor is still working there being geological. It all took me back to one of my undergraduate fieldtrips and time on a glacier (at which point we'll skate over how I nearly fell down a herring-bone crevasse). 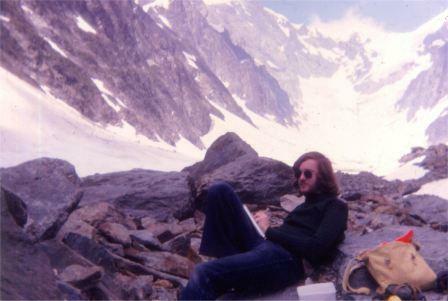 The picture on the left sees a late 1970s yours truly taking field notes on the said glacier's medial moraine in northern Italy (Val d'Aosta). Mont Blanc is off picture to the right. Spring 2015 Crossness celebrates its 150th anniversary. The Victorian sewage pumps ended London's Great Stink 150 years ago. Up to last year, for the best part of a decade, I had been providing the Crossness (restoration) Trust with its press liaison service. The 150th anniversary saw many who had been involved with the Trust over the years gather for a celebratory evening with heritage and local dignitaries. 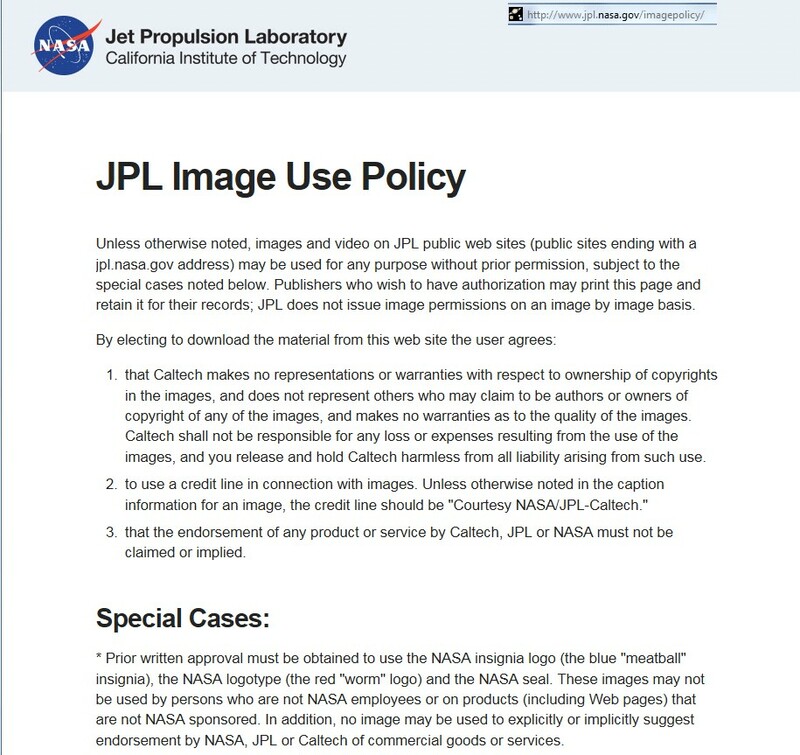 Copyright courtesy of NASA/JPL – Caltech. Spring 2015 'Climate scientists eye alien worlds' proclaims a Nature journal news article. The article reports on how NASA is now using climate change Earth system scientists to model life-viable exoplanets. 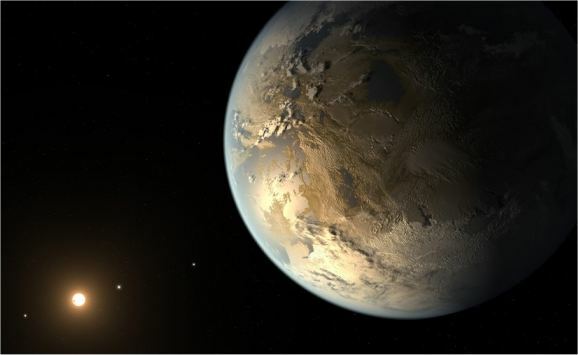 This is a welcome development, but one can't help but be mindful that over here in Britain, a number of us within the Geological Society's Earth System Science group have been using an Earth system science approach with climate change scientist to consider exoplanet biosphere viability for several years now. So this approach really is not that new but, hey, it makes for a good news story. Spring 2015 How close does one have to be to a red sun for photosynthesis? Indeed, is photosynthesis possible under a red sun? These are just two questions I've been contemplating for future appraisal while penning my next opus. If you are a biologist with a botanical bent and have any thoughts then do share. This graph I prepared in 2006 for my 2007 climate change book. There is well over the same amount of fossil fuel that we have burned to date still in the ground. 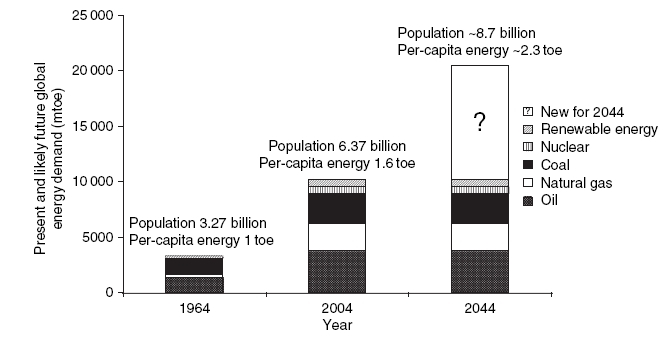 Should recent trends 1964 – 2004 continue (as they have to 2015) by 2044 global energy demand will double (see above diagram from Climate Change: Biological and Human Aspects by Jonathan Cowie). And should we then double atmospheric carbon dioxide (which if we follow current trends we will do well before the end of the second half of the 21st century), then warming will exceed 2ºC above pre-industrial levels! Spring 2015 'A new key science paper constrains fossil fuel consumption to keep warming within the so-called 2ºC safe limit. This is an alert primarily for those who use my university climate change textbooks. Textbooks inevitably do eventually date but they still have several years life in them. Nonetheless a few key papers can come out quite soon after any textbook's publication. With regards to climate change, Christophe McGlade's and Paul Ekins', of University College London, paper is one such key paper. 'The geographical distribution of fossil fuels unused when limiting global warming to 2·0°C ' published in the science journal Nature notes that as of 2011 we need to keep two thirds of known reserves in the ground. Globally, a third of oil reserves, half of gas reserves and over 80 per cent of current coal reserves should remain unused from 2010 to 2050 in order to meet the target of 2·0°C. They show that development of resources in the Arctic as well as any increase in unconventional oil production are incommensurate with efforts to limit average global warming to 2·0°C. Furthermore, it is unnecessary for continued substantial expenditure on fossil fuel exploration, because any new discoveries, if used, will take us over the 2·0°C safe limit. See also a general review article on the paper, and if you or your institution does not have a subscription access to Nature online, then there is an open access BBC News page covering this story.